In case you haven’t seen the sign on the office door, or in case you forgot the specifics as soon as you walked away (like me), the office will be closed Saturday morning but open on Sunday from 10–12 AM. It will also be open for a time on Monday afternoon to pick up last minute Christmas packages—exact hours have yet to be announced. For everyone who’s signed up for having their windows washed—The company is still planning to do the insides of the windows today; the outsides have been rescheduled for tomorrow when the winds and temps are predicted to ease up. 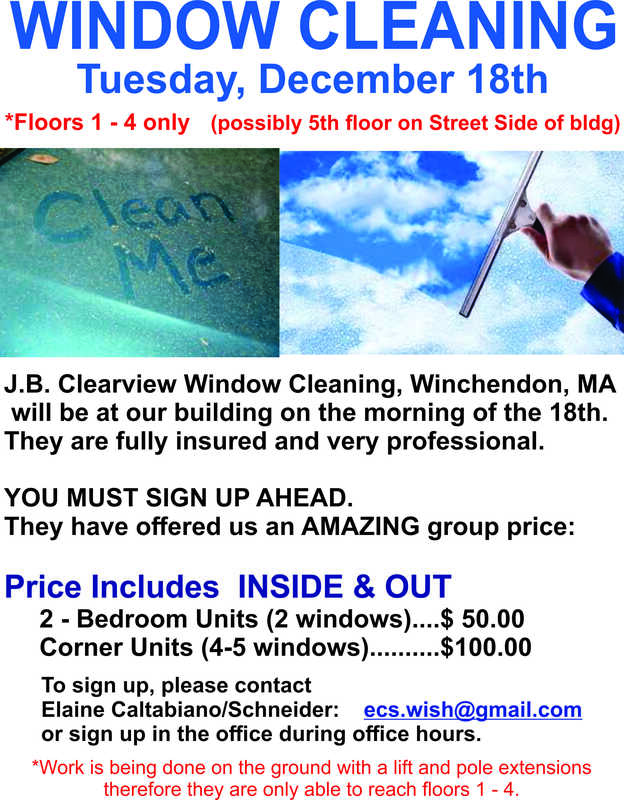 For anyone who hasn’t noticed the flyers scattered around the building, here’s the info about how to sign up for window washing if you’re interested. Just a reminder for those getting live Christmas trees: Please wrap your tree in a sheet or tarp when bringing it through the common areas to avoid leaving a trail of needles—this is particularly important later on when taking the tree out for disposal. I actually find the tree easier to carry if I place it on an old sheet and then knot the corners together to make a convenient handle. And please use the freight elevator for trees rather than the front one! Once the City of Lowell has this year’s information posted for dropping off used trees, and Boy Scout Troop #23 starts advertising their usual tree pickup fundraiser, I’ll post that info here. 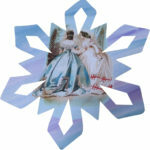 It’s that time of year again – holidays, gifts —– and BOXES and BOXES and BOXES! Please help out to keep our trash and recycling costs down during this season. Also, please be sure to put ONLY cardboard in the CARDBOARD ONLY bin; all other rubbish should be placed in plastic bags (no larger than Kitchen-sized bags) and either thrown down the chute or placed in the other bin that sits next to the CARDBOARD ONLY bin. Thanks so much for your help in keeping the season jolly! The annual City of Lights parade is this Saturday (tomorrow) and the temperature is supposed to climb out of the deep freeze just in time. For information about road closures and parking issues check here. For more about the festival check here. Local artists (including several of your neighbors) have contributed one-of-a-kind snowflakes to decorate store windows downtown and along the parade route. Keep an eye out for these beauties next time you’re out and about! Now that the weather has gotten colder, there’s a tendency to look for places a bit less raw to light up while keeping your own unit smoke-free. There is absolutely no smoking in any of the building’s common areas, including the fire corridors—it’s a real health issue to many residents, and a serious fire risk to the building, especially in our old, wooden stairwells. If one of those stairwells were to ignite, we could have a tragedy. I’d like to thank the people who take it upon themselves to populate the planters and water the plants on various floors of the Atrium, and who work to keep them healthy. The greenery is a wonderful addition to the space that we all share. One request: When pruning out the dead leaves, please see that they are disposed of properly and not left to get ground into the carpet. And I know from experience that sometimes leaves drop to the floors below when a person’s tending the plants and get left unnoticed; it would be great if everyone pitched in to pick them up when they see them and keep the place tidy. Thanks! It’s been brought to my attention (thank you, Dana) that the UnchARTed Gallery is running into financial problems and has started a GoFund me to tide them over while they do some restructuring. If you’re not familiar with them, they’re a fascinating little gallery with food, brews, and live music diagonally across the street from us. I just donated, in large part for the sake of their wonderful pizza! For more info and/or to donate, click here. I’ve been asked to share the info below. It sounds like an interesting, worthwhile event, and the meeting’s at the newly rebuilt, former train station on Central Street so you get a chance to see what the inside looks like! You are invited to assist us in advancing the dialogue to create the next priorities for the Lowell Waterways Vitality Initiative, the partnership coalition created by Lowell Heritage Partnership cooperatively with the City of Lowell, Greater Lowell Community Foundation, Lowell National Historical Park and others. Advancing our Shared Vision is an indoor and outdoor Lowell Walks-style tour about the history and potential of Lower Locks from community experts, including the architect that designed the lighting of the Bridge Street Bridge. This will be followed by facilitated discussion to gather your ideas and input on the Lower Locks, additional lighting opportunities, and recognizing other special places along Lowell’s waterways. Click the image below for a full size flyer. If you’re planning to attend to this weekend’s potluck in the Atrium—happening from 4:00 to 7:00 Sunday—and you haven’t yet signed up, please sign up here ASAP. The people kind enough to organize it are wondering how many to plan for. If you’re on the fence, please do come and join us. It’s always a pleasant, relaxing evening and you get to put some names to those faces you keep running into in the elevator. Plus the food is always plentiful and yummy!